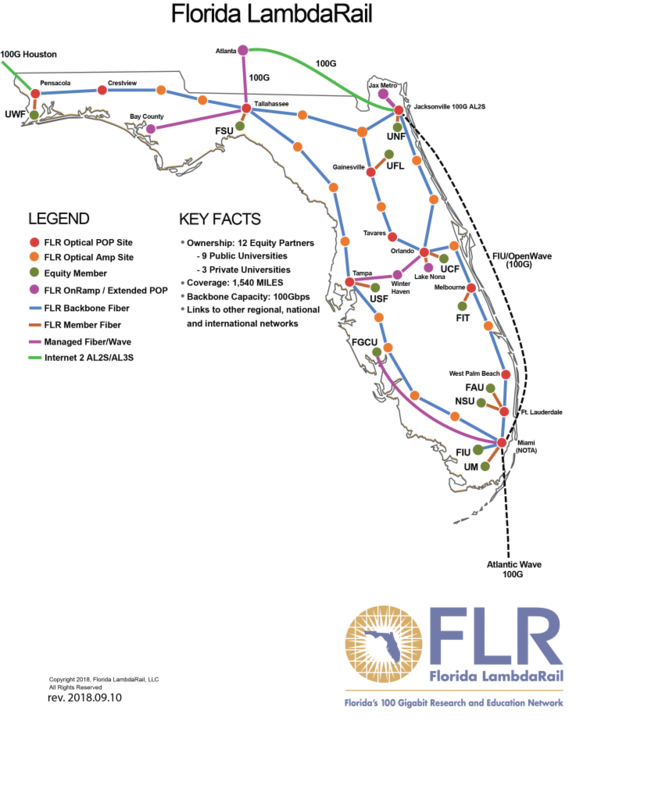 Deployed over 1,540 miles of dark fiber, the FLR network infrastructure provides for a dedicated statewide communications facility linking major nodes located in Pensacola, Crestview, Tallahassee, Tampa, Winter Haven, Miami, Orlando, Gainesville, Melbourne, Ft. Lauderdale and Jacksonville. The foundation of the infrastructure is a dense wave division multiplexing (DWDM)-based optical footprint using Cisco Systems’ NCS 2000 optical electronic systems with a capacity of 40 wavelengths per fiber pair. Each wavelength can support transmission up to 100 billion bits per second (100 Gbps). On top of the optical infrastructure is built an Ethernet based MPLS transport facility which provides for Internet, Internet2 and high speed IPv4 and IPv6 transit between participants. Additionally, private layer 2 or layer 3 services (VPN) may be provisioned. Each Equity Partner is provided a primary 10 Gbps and a secondary 1 Gbps connection to the MPLS backbone. Through advanced technologies, multiple waves are available along the optical backbone in support of primary and secondary access for each partner institution, as well as dedicated waves for research activities across institutional boundaries. The network operations center is hosted at the University of Florida. For more information, see the FLR NOC website. Utilizing dedicated and shared 100 Gigabit Ethernet, 10 Gigabit Ethernet or 1 Gigabit Ethernet high-performance data circuits, FLR participants are provided with additional capacity “on demand” to accommodate bursts in data-traffic, videoconference, or other special requirements. Connectivity to Commercial Internet Service Providers is available in order to provide economical and reliable Internet service to FLR participants. Connectivity to advanced production regional and national networks, such as Internet2, the GLIF, and Energy Sciences Network supports new applications and services. High Speed IP transit paths between participants, supporting both IPv4 and IPv6 protocols. FLR is designed to allow growth in terms of the number of hosts connected as well as the amount of data transmitted. Arrangements with other networks and traffic exchange points allow FLR to route and exchange network traffic, resulting in fewer hops and faster access to user destinations. For research applications needing a dedicated wavelength service, FLR offers participants point to point 1.0, 2.5, 10 or 100 gigabits per second optical lambdas as a complement to the FLR optical-based backbone services.